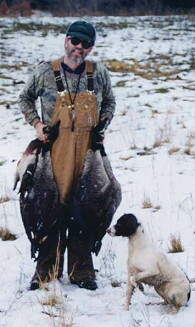 Homing pigeons can be quite useful in your dog training "toolbox." Especially with young dogs as fly-aways; properly trained they will fly right back to the loft and you can use them again day after day. Currently the market is glutted with homers - with the collapse of a major Ponzi scheme, many investors have a lot of pigeons and virtually no market. Very often they can be bought for less than feral pigeons. On the other hand, homers may result in more traps, especially when young. 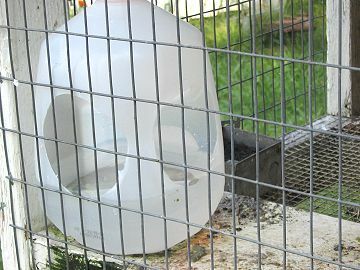 Here's a cheap, inexpensive waterer for your coop. Take a one gallon milk jug and cut two holes in it. Why two holes? You can face one hole to the outside of the pen, and the other hole is for the birds. The closed top keeps the pigeons from crapping in their water. When it gets quite dirty you can toss it. The hole may be cut with a box-cutter, or you can make a gadget called "the hole-i-nator". I suppose you could use a soup can, but I made a ring out of some scrap copper and affixed a handle to it. 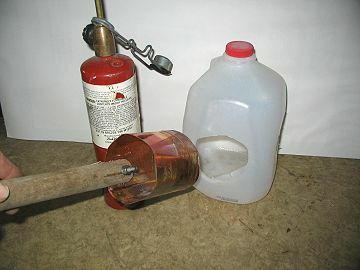 Heat the metal ring with a propane torch and melt a hole in the jug. Not only are these waterers free, but they work great. Also, in the winter, you can rotate several so they can thaw out in your basement and be re-used.